The waters around Koh Kood offer a number of beautiful and varied dive sites – some of which are yet to be discovered and explored! Here at Koh Kood Divers we pride ourselves in pioneering our way to finding new and interesting places to dive around Koh Kood. Infact, we are the only dive shop who specialize in diving the Koh Kood Waters. Consequently, most of the time we are the only dive boat at our dive sites, making for relaxed and quiet diving without hoards of other people. 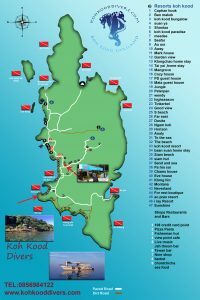 Of course, we will keep you updated of newly explored areas, but here are a few of our favorite places to dive around Koh Kood. 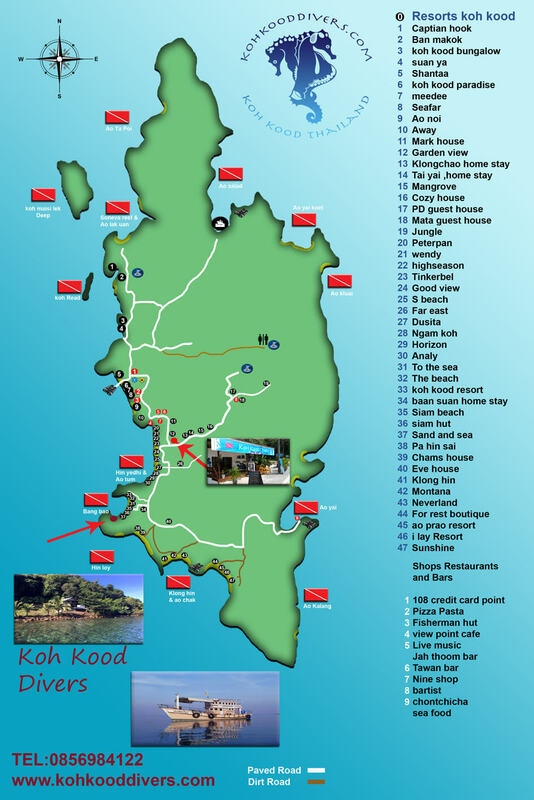 You can also take a look at our Koh Kood Map to see where the dive sites are located. Koh Raet is a small Island to the West of Koh Kood and a popular snorkeling destination as well as a great dive site. There are actually 2 dive sites here. The North end of Koh Raet is shallow 4-8metres with sandy patches and a variety of hard corals. It is a perfect shallow dive for beginners. The South gets deeper to around 14 metres with big spectacular boulder formations and many fish. Juvenile harlequin sweetlips hide within staghorn corals and humphead parrotfish are often spotted here. Whip rays are also found over some of the sandy patches. Hin Yedhi is so named because of the memorials found on this small Island. These belong to the grandparents of the Klong Chao Clan, (Yedhi meaning burial place or memorial). With depths from 4-14 metres cobia are often seen here as well as rainbow runners with schools of fuseliers, the odd lionfish and the occasional turtle too. Located infront of Koh Kood Divers shop, Bang Bao Reef is a shallow easy shore dive, perfect for beginners. The shore line is mostly big boulder formations which give home to a variety of young hard corals, plenty of anemones with schools of parrotfish. Juvenile harlequin sweetlips are often spotted hiding in corals and blue spotted ribbontail Rays are also common here. A drop dive from the shoreline into the bay. Ao Tum is a big dive site consisting of a beautiful coral garden and is connected to Hin Yedhi. It is full of fish with big boulders and plenty of hard corals. The varied marine life includes many different sting rays, batfish, cobia, rainbow runners, reef sharks. A highlight are the hawksbill and green turtles who are frequent visitors. A beautiful Pinnacle with plenty of colourful soft corals in which live many pacific blue striped pipefish. Saddleback anemonefish also make their home here in healthy numbers and we can also see little common brown seahorses over the sand. Other marine life includes batfish, butterfly fish, jacks, mackrel and rainbow runners. Ao Kalang is a shore dive with many big boulders and a variety of healthy hard corals, including some beautiful examples of table corals. Here we can also see stonefish and scorpionfish, and cuttlefish are spotted here regularly. Hin Loy is a pinnacle which sticks out of the water and drops down to 16+ metres. It is a great dive with big caves and swim thrus, huge potato groupers, schools of barracuda, fuseliers, oriental sweetlips. Corals are varied and you can see beautiful fan corals, barrel sponges and elephant ear sponge here too. Klong Hin is actually 2 dive sites, and is also named Anemone Bay due to the huge number of clownfish and anemones found here. Big boulder formations with schools of parrotfish, big groupers, occasional turtles, moray eels and a variety of sting rays and whip rays. An especially good place to find the beautiful saddleback anemonfish. This reef is found in the middle of Salad Bay and has a lovely variety of both soft and hard corals. this is the only place on the island we can find big red sea stars. A gentle shore dive with plenty of healthy hard corals and big boulder formations. All the usual reef life can be found here including saddleback anemones and plenty of blue spotted rays. A beautiful Pinnacle with plenty of colourful soft corals in which live many pacific blue striped pipefish. Saddleback anemonefish are also making there home here. In healthy numbers and we can also see little common brown seahorses over the sand. Other marine life includes batfish, butterfly fish, jacks, mackrel and rainbow runners. Koh rang marine park is close to koh mak so its 1 hrs 1/2 boar ride from koh kood.because its a marine park there is a extra entry fee 200 bath for snokelers and 400 bath for diver. things to see Yellowtail Barracudas, Stonefish, Murene, Catfish, Triggerfish, bannerfish , Angelfish whale shark and lots of more nice marine-life!! On the 22nd of November 2012 the HTMS Chang has been sunk. The wreck quickly turned into a great artificial reef full with marine life. It is truly a spectacular wreck dive, the bottom is on 30m, the topdeck on 21m, captain’s cabin and mast on 12 meter and reaches to around 5 meter perfect for a safety stop. The ship is 100m long, making it the biggest shipwreck in Thailand.